Among the millions on Paris streets overnight, Adelaide’s Rachel Spencer records her response to the extraordinary show of solidarity in support of freedom of expression. Paris, Sunday, 2.20pm: I am walking along the Rue de Trévise in the 9th arrondissement. It is colder than yesterday, about 8 degrees. The mood is calm and friendly compared to yesterday’s anxiety. Couples stroll hand in hand, parents push prams, little girls skip. There are groups of three, four, six, all walking calmly, but with purpose. Some carry printed A4 size banners that they have downloaded from the internet: Je suis Charlie. There is a steady stream of people, almost all walking in the same direction. They are all heading towards the Place de la République which is about 2 kilometres from here – normally about a 20 minute walk. 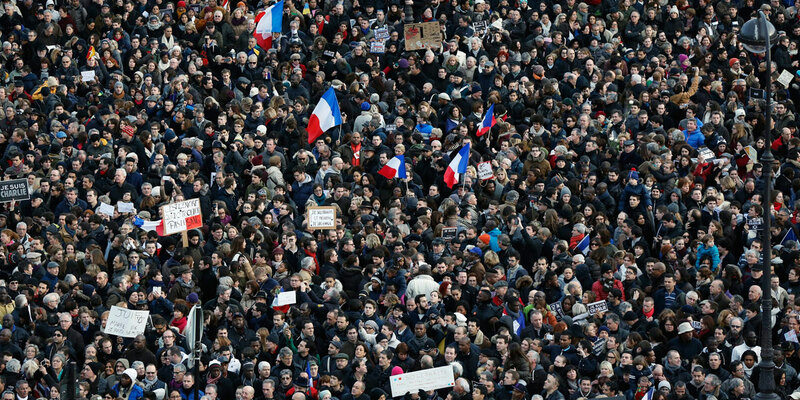 Je suis Charlie but I have a fear of crowds. I want to go to the rally to experience being part of this experience of solidarity, to join the hundreds of thousands who are angry about the murders of writers, artists and ordinary citizens. On Wednesday, two gunmen killed 12 people at the offices of a satirical magazine Charlie Hebdo. The assassins escaped capture until two days later when they were found and killed in a confrontation with police. At the same time, another related incident saw four more people killed in a supermarket. The attacks have prompted not only an outpouring of disgust and defiance against these atrocities but also a unification of the French people. Almost overnight, the slogan Je suis Charlie (I am Charlie) has been adopted as a symbol of unity. It is displayed in shops, on cars, in the newspapers, on social media and in graffiti. “I am Charlie” not only means “this could have been me” but it encompasses all that we value in a liberal democracy, most particularly the right to speak about what we are thinking and to articulate our views. Debate and discussion are the foundations of good decision-making and enlightened thought. Education necessarily involves the exchange of differing points of view, including radical and provocative perspectives that challenge our habits and force us all to keep re-thinking how we do things and the meaning of what is ‘right’ or ‘good’. I want to be a part of this passionate backlash against senseless violence. I want to follow my fellow thinkers to the Place de la République. But I am afraid to be alone amongst thousands of strangers. I sometimes have to fight panic attacks when I am in the métro or in crowded shops. I am quite short, I can never see much beyond other people’s shoulders, I don’t want to be trapped for hours. I don’t want to get lost. Facebook posts yesterday warned that mobile phone coverage will be poor because of there being so many people. The métro will be overloaded, and once I form part of what is going to be one of the biggest demonstrations that Paris has ever seen, there will be no turning back. I stop on the footpath and slowly turn around and head back against the tide of pedestrians. Back in my apartment (well, it’s mine for a couple of months) I watch live coverage on Youtube. The camera zooms in on a helicopter circling in the sky which is blue after yesterday’s gloom. It then pans back across the crowd. I admire these people for bringing their children, for teaching them that this is good, normal behaviour, to participate in democracy, in life itself. One person holds a giant yellow pencil that from time to time dominates the screen. It is a powerful symbol of not only the power of the pen, but its importance, and the fact that all of these people are here to defend its use. I search for more live coverage and find another perspective from a different camera. World leaders walk in a line, looking resolute but slightly nervous. Their arms are linked. Angela Merkel’s face is tight; she is concentrating intensely. Every now and again she smiles as if remembering to do so. Her eyes move from right to left, all the time vigilant. Francois Hollande, whose arm is linked through hers, appears more relaxed. Distributed evenly amongst the front line are security guards, their tell-tale wires down the backs of their necks revealing their role. Their faces are the most anxious of all. I flick to another live coverage which reveals the extent of the crowd. People fill every available space. A camera which must be in a plane or on a crane, pulls out to an extremely long shot to show the enormity of this event. There are people as far as the lens can capture. As I watch this, and think more about it, tears prick my eyes. One sign in particular is blunt: Des morts pour des dessins (Death for drawings). This short phrase, scrawled on a piece of cardboard, reminds us of what really happened here. Honest, ordinary people were murdered for writing and drawing. For expressing their thoughts. That is the real significance behind the slogan Je Suis Charlie. We are all Charlie because we all have thoughts. We all react to events. We all have an emotional response to everything we see and learn about. The poignancy of the symbol of the pencil underlines the significance of the simplicity of this. The camera pans back to the sign attached to the statue in the Place de la Republique. It is typical of a French jeu de mots (pun), a linguistic technique at which the French excel. Descartes’ oft cited aphorism Je pense, donc je suis (I think, therefore I am) has been re-interpreted as Je pense donc je suis Charlie (I think, therefore I am Charlie). This rally demonstrates that the power of thought is what makes us human. We are all Charlie because we have not only the power to think, but the power to use our thoughts for good. I am not much good in a crowd but I can express my support alone by writing. Writers are often solitary people. I wouldn’t be surprised if the journalists who worked for Charlie Hebdo were similarly socially challenged. It is 4.20 pm. The video footage shows that the crowd in the Place de la République is slowly becoming more fluid and that people are starting to move more easily. I am not sure how I would have coped in all of that seething humanity. Flags are waving and there is a lot of shouting but I can’t make out the slogans that are being chanted. Every few minutes there is a rendition of the first verse of La Marseillaise. Back home in Adelaide, it is 2 am. Everyone is Charlie there too. Rachel Spencer works in the School of Law at the University of South Australia. She is in Paris for a combination of a holiday and writing retreat.